The quaint locale of Rachol in South Goa houses a historical legacy of the Portuguese era. The Patriarchal Seminary of Rachol is not only the spiritual and educational home to its seminarians in these times, but it stands as a visual testament to the history, art, culture and architecture of a bygone age. The Jesuits founded the College of the Holy Spirit in Margao in 1574, which was, however, shifted to Rachol twice owing to the consistent threat of attacks on Margao from Adil Shah of Bijapur. The fortified village of Rachol, which was a Pre-Portuguese fortress, subsequently rebuilt by the Portuguese, proved to adequately secure the college. The foundation was laid for a church and college in Rachol in 1606. An orphanage, a hospital, a catechetical school for catechumens, a Portuguese primary school, a Konkani school for foreign missionaries and a moral theological school were all part of this college. The college boasts of having the martyred Blessed Rodolfo Acquaviva, Englishman and linguistic genius Thomas Stephens, and the author of Oriente Conquistado Francisco de Souza as former rectors. The printing press at Rachol churned out 16 books in total. The first text to be published was the Krista Purana (Discourse on the Coming of Jesus Christ Our Saviour to the World), in literary Marathi by Thomas Stephens. This was followed by Stephens’ Doutrina Christam em Lingua Bramana Canarim (a work on Christian doctrine in the dialect of the Brahmins of Goa) and Arte da Lingoa Canarim (Grammar of Canarim language), which was the revised version of the original work of Thomas Stephens. Regras da Companhia de Jesus (Rules of the Society of Jesus) was the last book to be published here in 1674. Initially dedicated to All Saints in 1610, the church and college eventually came to be named after St Ignatius of Loyola, following his canonisation in 1622. After the Jesuits were expelled in 1759, an Archdiocesan seminary was instituted for the formation diocesan clergy. It was dedicated to the Good Shepherd and called Seminario do Bom Pastor. The direction of this seminary changed hands a few times between the Oratorians and the Congregation of the Mission. The diocesan clergy took over when all religious orders were banished from Portugal and its territories in 1835. The seminary attained its present name of Patriarchal Seminary of Rachol in 1886. The seminary completed 400 years in 2010 and the two storey quadrangular edifice has certainly stood the test of time. An excellent example of Indo-Portuguese Christian architecture, the structure has magnificent oyster shell windows, wooden flooring, high ceilings and stone stairs. The black granite stone used to build these stairs was brought as weight to keep the Portuguese ships returning from Europe, divested of their cargo such as spices and the like, stably buoyant. Within the enclosure of the quadrangle lies a now defunct cistern that in the past collected rain water which was used by the inmates. There is a story that says that it acted as a safe haven for native refugees in troubled times. Some sources report it to have once been a water tank or tirth attached to a Hindu temple. This conclusion is based on the remains of a Nandi bull, signifying a Shaivite cult, and an image of the god Bhairav, denoting the existence of Vaishnavism. The church dedicated to St Ignatius of Loyola has a magnificent gilt carved altar with the crucified Christ at the top centre, flanked by statues to the left, right and bottom. There are lateral panels inside the sanctuary that represent important scenes from the life of St Ignatius. 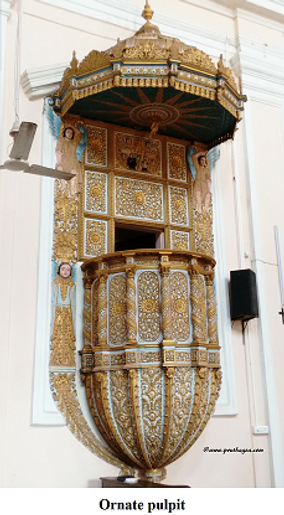 The church’s ornate pulpit stands out in its gold leaf endowed resplendence. 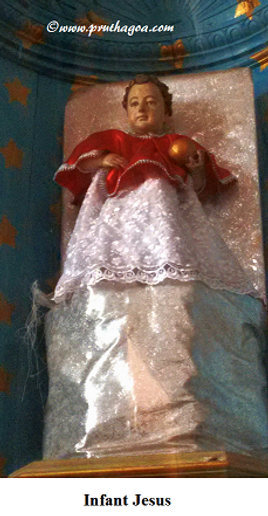 One of the smaller altars to the left has the miraculous statue of the Infant Jesus of Colva that was found on a rock on the coast of Africa by a Jesuit priest called Fr Bento Ferreira. It was first kept at Colva and later moved to Rachol, where it purportedly stopped working miracles. The sacred bone relics and a vial marked with blood belonging to St Constancio or Constance (martyr) were brought here by the Vincentians and are located in the small chapel to the left of the church near the entrance. St Constancio was invoked by married women to protect them against widowhood. His remains were exhumed from the cemetery at Ponciano and brought to Goa in 1782. The bones were laid out in the form of a body by Archbishop Fr Manoel de Santa Catharina and shown in a martial uniform to emphasise that the saint is a soldier of Christ. 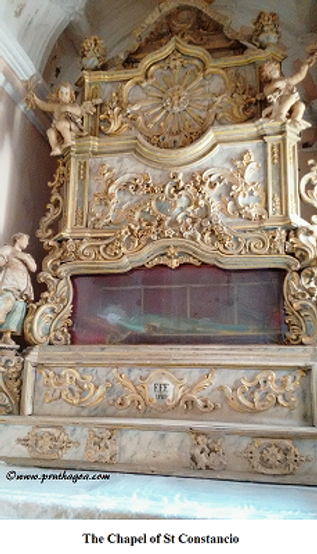 The FFF painted on the tomb stand for Fides, Fidelis, Fecit (The faith of the faithful has produced this). The saint is reported to have worked many miracles. Fervour for this devotion suffered, however, owing to a controversy related to the authenticity of the relics. Next to the Chapel of the Good Shepherd on the first floor is the room that sheltered a famous resident, venerable Fr Agnelo de Souza, SFX, as he carried out the functions of a spiritual director from 1918 to 1927. Swami Vivekananda is said to have visited the seminary and referred to some of the oldest books in its library. This famous library was blessed with the patronage of Archbishop Amorim Pessao who contributed a collection of 7300 books, bought at the same time. The seminary has grown structurally, with more modern additions being included over time to meet the needs of the students. The array of paintings, mostly copies by SK Parab (1943-44), in the various corridors lend an air of piety that blends well with the peacefulness of the environment. 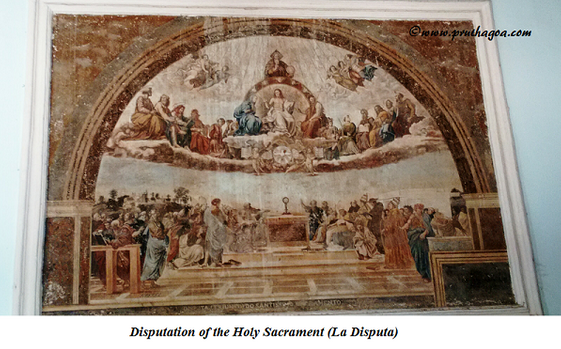 One painting that holds your attention is the Disputation of the Holy Sacrament (La Disputa) by Raphael in the church top corridor. The Indianised Christian paintings of our own Angelo Da Fonseca have been copied and adorn the infirmary corridor. There are copies of other Renaissance masters such as Tiziano Vecellio, Albertinelli and Rubens. It is unfortunate, however, that many of the paintings have been ruined altogether or partially destroyed. At present, the painting of Dom Sebastiao, King of Portugal, titled Armas del Rei D Sebastiao Fundador do Collegio, which denotes him as founder of the college, is being restored. The priestly formation takes a holistic approach by encouraging personal growth, participation in sports, music (The Choir of Santa Cecilia was established in 1897), gardening, farming, manual labour, etc. The spiritual formation and academic formation by way of courses in philosophy and theology are part of the process of seminarians being moulded into able priests. They are also sent out to pastoral visits to prisons, orphanages, broken homes, the sick and the elderly and so on. The serenity of the Patriarchal Seminary of Rachol is only broken by the occasional footfall and voices of seminarians and priests. This integral part of our Goan heritage lives on as beacon of divine hope, producing priests for the spiritual development of the Catholic laity.